While Pearl Jam vocalist Eddie Vedder recently faced criticism over a anti-war speech, the singer has also seen a lot of support for his peace-seeking words. 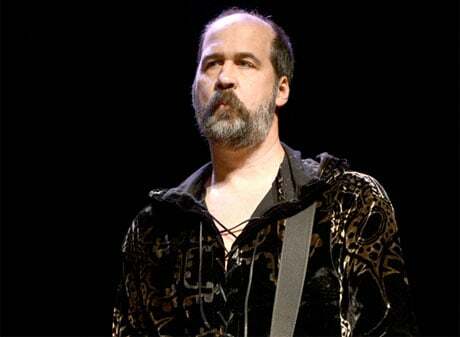 Now stepping in to back the rocker and add a few words of his own is Krist Novoselic. An open letter from the former Nirvana bassist applauded Vedder for standing up and speaking out against the current Israel/Palestine conflict. While detractors alleged that Vedder's words, which castigated war practitioners "looking for a reason to kill," were "anti-Israel," Novoselic refuted those claims by thanking Vedder for "speaking up for peace in our world." In his letter, Novoselic presents his analysis of the currently war-torn region, calling it "a continuing catastrophe," looks at the history behind the conflict, and notes that there are bigger issues at hand than a rock singer speaking his mind. "The people of Palestine and Israel deserve peace and prosperity. It is time to stop repeating the same old arguments, dogma and hate speech. It is the knuckleheads on both sides that should be criticized and not the singer from a rock band," he wrote. You'll find the full statement down below. As for Vedder, a solo show this past weekend in Meco, Portugal, had him covering John Lennon's "Imagine," calling it "the most powerful song ever written," and further addressing his stance. "If you're anti-war it doesn't mean you are 'pro' one side or the other in a conflict," he said. "However, it does make you 'pro' many things... Pro-peace, pro-human, pro-evolution, [it] makes you pro-communication, pro-diplomacy, pro-love, pro-understanding, pro-forgiveness." You'll find a fan shot video of the performance down below. Thank you Eddie Vedder for speaking up for peace in our world. Eddie has gotten some criticism over comments he made about the conflict between the Palestinians and Israelis. That situation has been messed up for so long, it is no wonder that even mentioning it is toxic. Let's face it, the relationship between the Palestinians and the Israelis is a disaster! I don't know how many times I have heard the same explanations and excuses and it matters not, there is a continuing catastrophe between those two peoples. Our world is connected as never before. People from all corners of the planet share culture and commerce at the click of a mouse. In contrast to this great convergence of humanity, Israel is building tall concrete walls while Palestinians fire rockets over them. There's a shared recent history between these people, and I think there could be a shared future that's more in tune with what's going on with our ever-connected universe. Hamas' policy of not recognizing Israel is a dead end. All our lives are a result of the course of history. In other words, one thing leads to another, and our circumstances bring us to where we are. Israel has been a state for over 50 years, and has grown to seven million citizens. Furthermore, Israel is an inclusive democracy with universal human rights. In fact, Arab Israelis, like all its citizens, can vote for parties who hold seats in the Knesset, the national legislature. However, if there is to be recognition of the course of history, we cannot forget the demographic changes the idea of Israel has created over 50 years. The influx of people into Israel–mostly Europeans–has displaced some four million Palestinians. You can give any anecdote you want about how small Israel is in comparison to the rest of the Middle East but the sentiment is still there–Palestinians feel that their land was taken away. The region is host to the convergence of Islam, Judaism, and Christianity. It's where these religions started, and the region's extensive history draws from all three of these Abrahamic faiths. Radicals hold eschatological beliefs that, if manifested, could set off a major religious conflict in the region and world. You have to credit Israel for keeping a lid on this dynamic while at the same time granting religious freedom. As we've seen with other conflicts, things do and can change. The "troubles" in Northern Ireland were a result of events a century ago, and after a proactive effort, peace has taken hold. Yugoslavia was another 19th-century idea that when put into practice caused much controversy and conflict. Today we find the south Slavs working to come together in the European Union. In both these cases, a resolution of the conflict was buttressed by the promise of the stability needed for prosperity to happen. The people of Palestine and Israel deserve peace and prosperity. It is time to stop repeating the same old arguments, dogma and hate speech. It is the knuckleheads on both sides that should be criticized and not the singer from a rock band. In addition, both sides need to make hard decisions about finding a settlement to the catastrophe that is Israel/ Palestine. Thanks Eddie for sharing your feelings. I stand with you my friend!! !